Grilled steak kabobs is a simple meal that takes more time to prep than it does to cook. There are some basic grilling principals that you will want to follow in order to make sure you cook these kabobs to perfection. The biggest concern you should have is making sure that you don't overcook your steak. Since most people don't just grill steak on a skewer by itself, you need to factor in the amount of time it will take to cook the other items on the skewer. 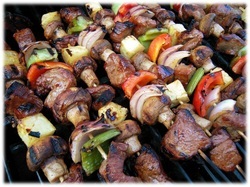 Try to avoid putting anything on the skewer that will cause you to leave the kabobs on longer than the steak. Do this by cutting any food down to a similar size of your steak cubes. Take your 2 steaks and lay them out on a cutting board. Cut the steaks into cubes about 1 1/2 inch across. Place all of the cubed steak pieces in a mixing bowl. Drizzle olive oil, Worcestershire sauce, garlic pepper and steak seasoning to fully coat the steaks. Leave the steaks in the bowl for 2 hours in the refrigerator to let them marinate. Cut all of the vegetables into small pieces and lay them all into separate piles. 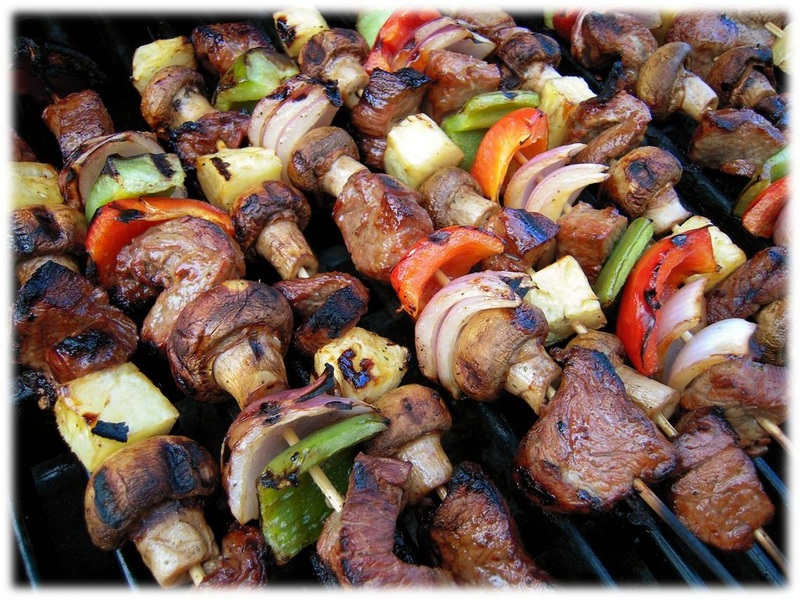 Take the marinated meat out of the refrigerator and slide the meat and vegetables onto the skewers, rotating each vegetable around the meat to add an aesthetic appeal to each skewer. Place your skewers on the grill over medium-high heat. The kabobs will take about 10-12 minutes to cook and you will need to rotate them a few times throughout the grilling process. Steak kabobs are easier to cook than a full size steak because you are just grilling small pieces that don't take as long. You just want to make sure the outside of the kabobs have a nice char on them and cook them for about 5 minutes on each side. One thing you can do is to use the steak doneness test to figure out when to pull your steaks off the grill. You always want to avoid cutting into a steak to determine if it is done, because this will cause your juices to escape the meat and make it much more tough.